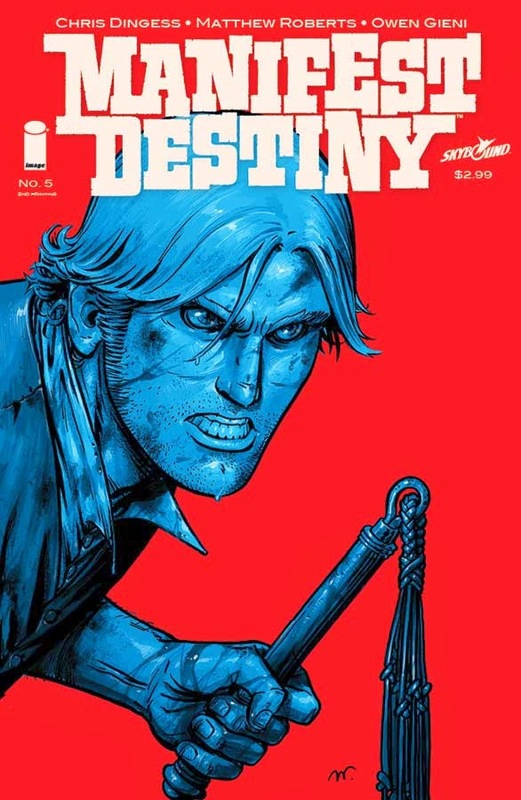 The fifth issue of Chris Dingess (Being Human) and Matthew Roberts’ (BATTLE POPE, FOUR LETTER WORLDS) critically acclaimed Skybound series MANIFEST DESTINY has sold out instantly and will go into its 2nd printing. Join readers and critics on a fantastic journey through a New World riddled with mysterious phenomena. Here there be monsters. MANIFEST DESTINY #5 has completely sold out at the distributor level, but may still be available in comic stores, and is currently available digitally on the Image Comics website (imagecomics.com) and the official Image Comics iOS app, as well as on Comixology on the web (comixology.com), iOS, Android, and Google Play. The second printing of MANIFEST DESTINY #5 is available to order with Diamond Code JAN148384 and will be released on 4/9. MANIFEST DESTINY #6 is available to order for $2.99 with Diamond Code FEB140609 and will hit stores on 4/9.